'Pranavam pictures' was his home production company. He produced some films that became hits. Then he formed his own distribution set up called 'Pranav pictures'. But he had to terminate his projects and concentrate on acting after the production of the prestigious Indo-French film Vanaprastham directed by Shaji N Karun. Though it went around the world in many international film festivals, it did not fetch money. He incurred a huge loss of 2 crores. However he cherishes the moment in Cannes when the audience stood in respectful silence after watching the film. 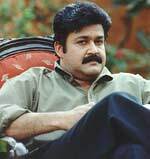 The art form, the actors and specially Mohan Lal were highly appreciated. While he concentrates on acting, he hopes Vanaprastham would bring him the money slowly through international TV channels. Recently he was in Trivandrum to attend a press conference, where he revealed his intention to get into TV production. His company, Visual Magic, intends to produce children's films in association with Asianet communications. He is on to DVD production also. Can you tell us about your new company 'Visual magic'? Is it going to concentrate only on TV programs? Yes. We aim at TV. 'We' here means Asianet and Visual Magic Ltd. My friends are also into this project. What is your first project? It is TV adaptation of 'Ithihyamala' (it is a celebrated book of legends in Malayalam. It deals with real stories about temple elephants, magicians, practitioners of traditional village medicine etc.) I have been dreaming about picturising those stories for our children. I love children's films. Unfortunately we do not have good and enough children's films in Malayalam. Are you going to produce children's films? Yes, we hope to produce it without delay. My friends, P Balachandran and T K Rajeev Kumar are also into it. Earlier, there was nobody to lead them or encourage them. We discussed this topic seriously and the company was formed. How do you plan to shoot 'Ithihyamala'? There are a number of stories in that book. Each story will be told in five episodes. We are engaging the best directors in Malayalam to do it. We will get a panel of directors. We expect the series to go on air in January 2002. Malayalam channels have good audience in and outside Kerala and in some foreign countries.Children's film will come in the next phase. T K Rajeev Kumar will direct this. I have some other projects in mind. I have one more project for children, an exclusive children' website.